We research and develop technologies that will enable next-generation rich, personalized, and interactive mobile applications. 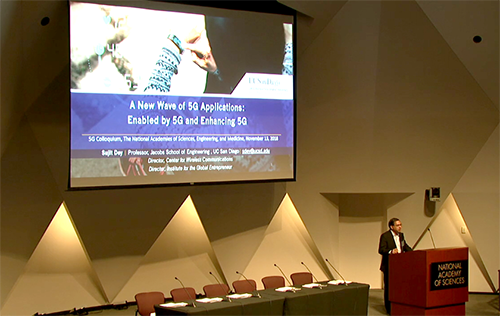 Our lab is headed by Professor Sujit Dey, who is also the Director of UC San Diego Center for Wireless Communications. We research and develop technologies that will enable next-generation rich, personalized, and interactive mobile applications. Our research includes developing new mobile cloud computing architectures and algorithms, media analytics and personalization techniques, adaptive cloud media delivery techniques, application aware green communication techniques that reduce power consumption of both mobile networks and devices, and hardware-software design technologies to ensure reliable, low-power, and variability tolerant systems. W. Wei, and S. Dey, "Center of Mass Estimation for Balance Evaluation Using Convolutional Neural Networks," to appear in the Seventh IEEE International Conference on Healthcare Informatics, Beijing, June 2019. Our research includes developing new mobile cloud computing architectures and algorithms, media analytics and personalization techniques, adaptive cloud media delivery techniques, application aware green communication techniques that reduce power consumption of both mobile networks and devices, and hardware-software design technologies to ensure reliable, low-power, and variability tolerant systems.